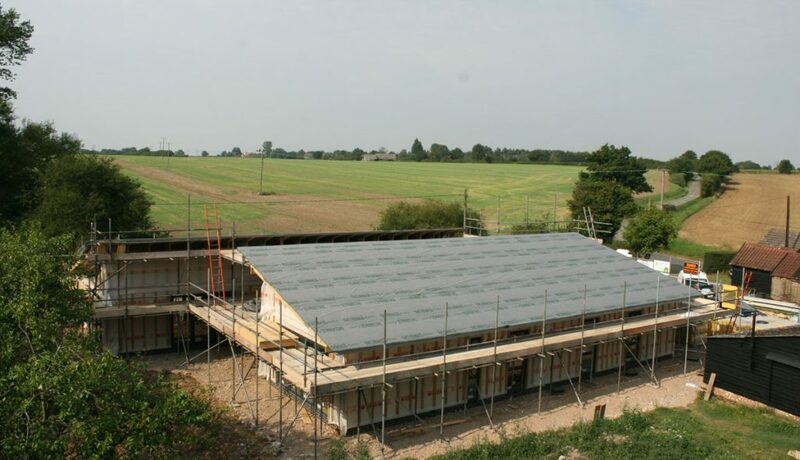 Svenskhomes release new time lapse video of a new 214m2 luxury eco-home in Wattisham, Suffolk. The video shows a crane lifting the super energy efficient Svenskhomes timber wall sections into place. The benefits of using these modern methods of construction techniques are many, allowing a strong focus on insulation levels, pre-fitted triple glazed windows and doors, precision manufacturing process and a rapid construction schedule. Aided by some late summer sunshine this large contemporary design was installed within just three weeks and actually handed over one day ahead of schedule ready for first fix to commence. The install team erected the Svenskhomes closed panel timber frame wall system and fitted sarking substrate across the independent mono-pitch roof design. All internal partitions walls, insulation details and high performance vapour control layer systems completed for the customer and his principle contractor to continue with the project. In the next few weeks we are excited to look forward to seeing the building take shape and the reality of the customer’s own grand design. The building will be complemented with a standing seam metal roof and larch cladding. The Svenskhomes building envelope will then be married with the latest renewable technologies such as a high performance MVHR system and Air Source Heat Pump to realise and A Rated EPC with minimal running cost.